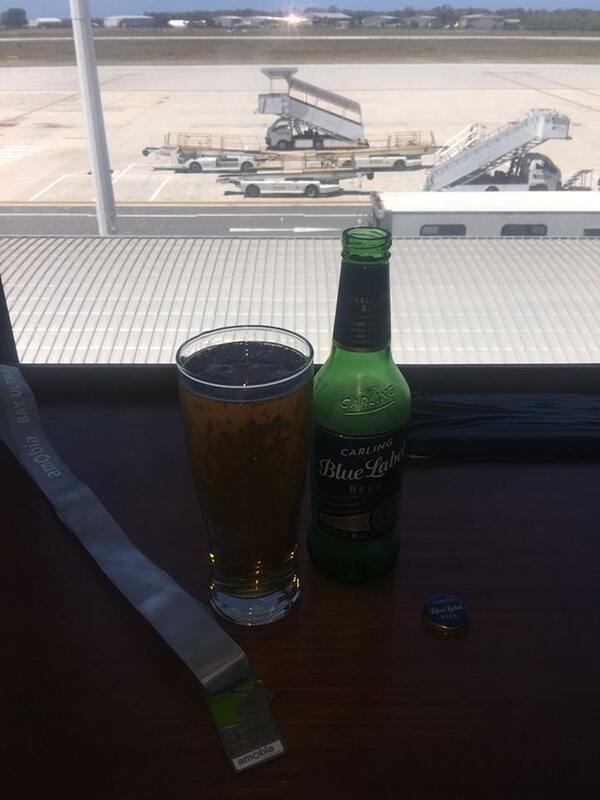 I was surprised that most of the budget airlines don’t fly into Port Elizabeth – and those that do don’t offer good “in-and-out for a marathon” flight times. Therefore, I had to settle for a premium priced airline offering budget rate service. Nothing signifies the decline of the British Empire quite like the experience of flying British Airways. Short BA Rant: I am fortunate enough to fly business class when travelling long distance for work. I was unfortunate enough to choose BA on my last trip to London. I knew I was in trouble when the (British) frequent flyer next to me pulled out a Woolworths packet containing his “supper”. He explained that he’d made a special trip to buy food before his flight home because the onboard food is so lousy (hate to think what it’s like in economy). He spent the “polite conversation to the stranger next to you” section of the flight complaining about BA who “love their shareholders but hate their customers”. Without going into the gory details (perhaps another blog post will do so), I can confirm that (other than legroom) flying economy on Emirates is orders of magnitude better than flying business on BA. In-flight turbulence? One more way that BA hates their customers. 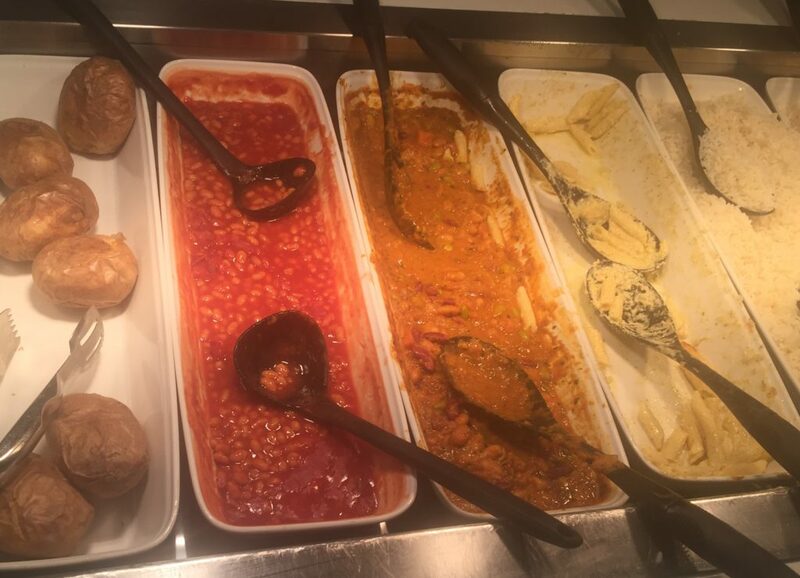 Beans in the business class lounge. Not a good idea when you’ve got 12 hours of recycled air to endure. However, BA was the best option for the flight times I needed (and I could use my Vitality Diamond status to get a 35% discount). To be honest, the 90 minute flight was not bad (the complimentary drinks service helped to wash down the partially edible lunch – when you’re confined, hungry and bored it’s surprising what you’ll stomach). Port Elizabeth is the largest city in South Africa’s Eastern Cape Province (with over 1.3 million people living in the municipality). Part of the charm of PE (as she is commonly known) is that you get all the big city conveniences whilst retaining the small-town look and feel. The airport is 5km from the suburb of Summerstrand – where the marathon starts (the South African leg of the IronMan is also held here). The airport is small and efficient so you can get your rental car and be in your B&B less than 30 minutes after landing. From here, it was a short drive to race registration at the local lifesaving club which included a small expo. A small expo and a nice goodie bag are included in the R180 entry fee. The race has had 36 editions although the route and format has evolved over the years – there is a great write up on the history of the race here. To me it’s slightly disturbing how a beautiful and well-organised race like this has struggled for sponsors over the years. Over the last 10 years the Ultra has had between 250 and 400 finishers and there were about 400 this year again. It’s a pity that excellent races like this (and there are many others) do not seem to be benefiting from the current marathon running upswing whilst other (much more boring) races hit their quotas and have to turn runners away. That being said, it’s great that the race seems to have found a good sponsor in Amobia (who specialise in wireless and fibre internet solutions). A 5am start allows runners enjoy the sun rising over the sea (picture from the Bay Ultra Facebook page). Race day conditions were excellent for running. 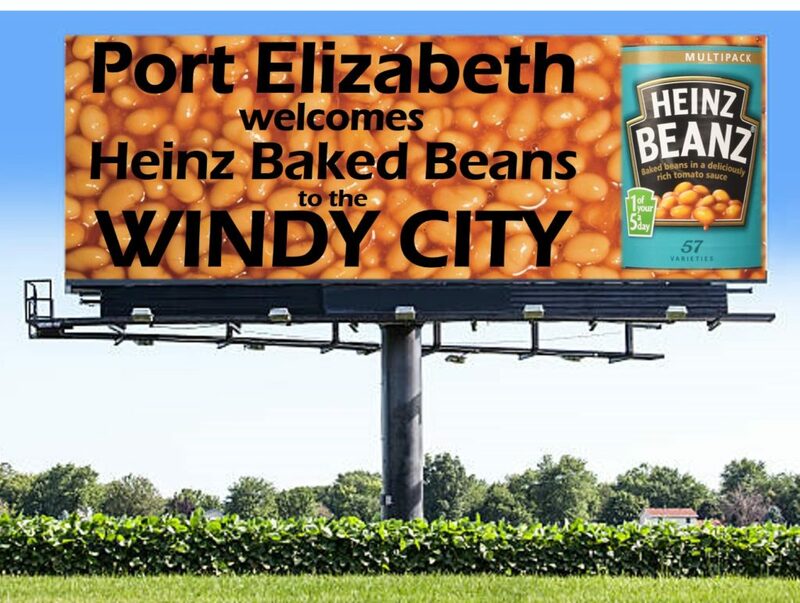 Port Elizabeth is in the unique position of having two official nicknames – the “Windy City” and the “Friendly City”. 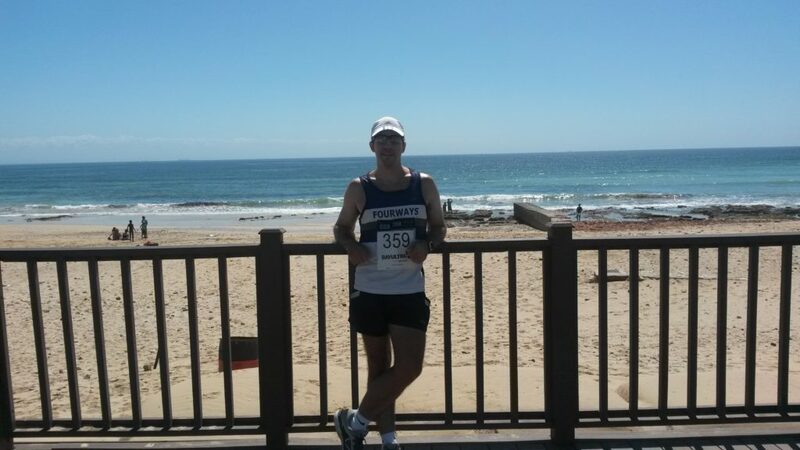 The people in PE are definitely friendly but both marathons I’ve run here have been in perfectly still conditions – so I’m wondering if the “Windy” tag is just a ruse to try and keep the Vaalies away? Either that or it’s some kind of twisted insider joke to do with flatulence*. Random Thoughts While Running – A billboard I’d like to see in PE! We set off at 5am from Pollok Beach and got to enjoy the sunrise over the first few kilometres. 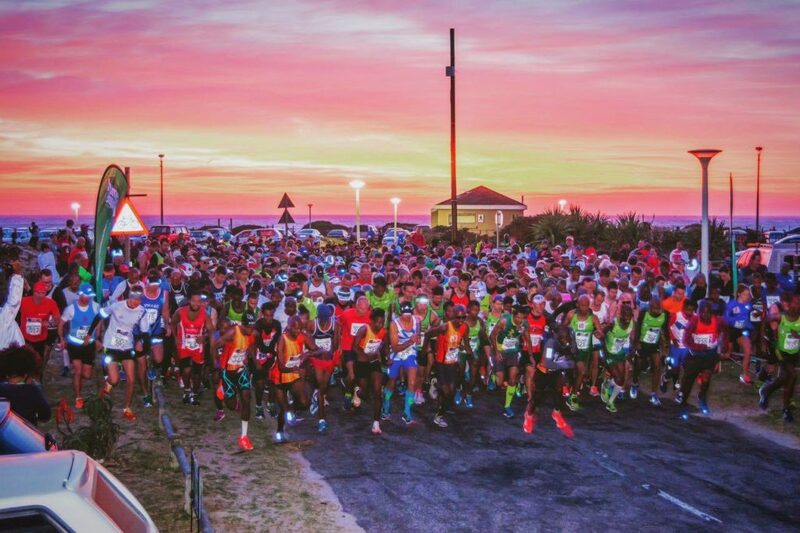 Port Elizabeth is not a hilly city so the organisers did really well to find (and fit) every hill in the greater Nelson Mandela Bay Municipality into the first 30km of the route. The great thing about living and training on the Johannesburg Highveld (1600m above sea level) is that coastal hills are mere speed bumps when you’ve got thick air coursing through your lungs*. * Whilst this may hold true for Highveld runners during the first 30km of a coastal ultra, the same does not apply after 30km – as those who have huffed and puffed up Constantia Nek (42km to 46km into Two Oceans) will attest. Support tables were frequent. The first three only had water and I was worried that that would be all we would be getting (I don’t run with supplements but do need some “fizzy drink” sugar to get me through an ultra). However, from 13km, Coke and Cream Soda were added to the mix. 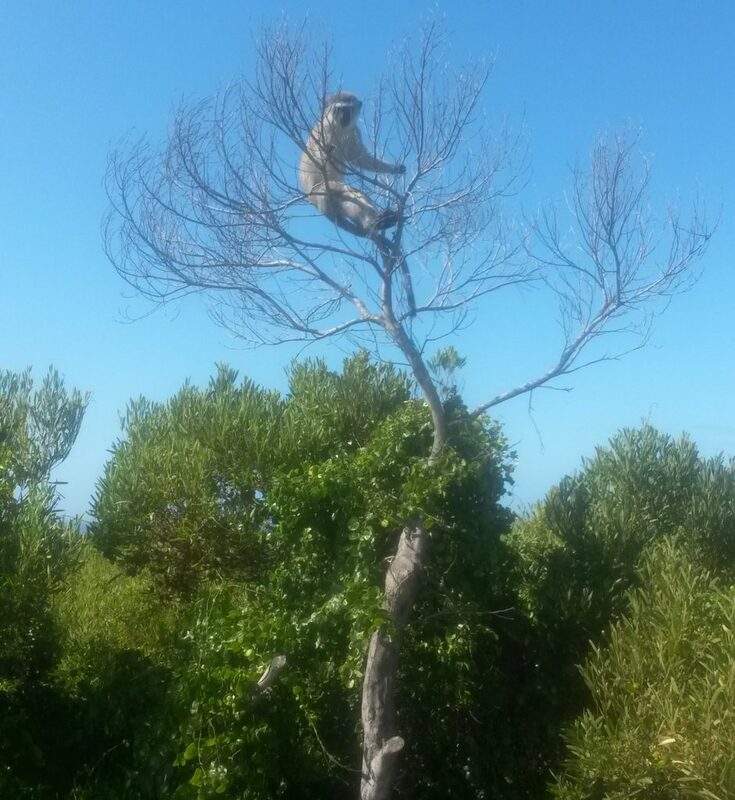 There was not much support along the route except for a troop of vervet monkeys. This oke was the boss and agreed to pose for a photo. People sometimes make jokes about PE being slightly backward. However, I discovered that they are actually ahead of the rest of the world (those who use the Gregorian calendar anyway). Most provinces provide a January schedule that allows their runners to slowly progress into marathons and hold back on the ultras until well into March (e.g. Joburg’s January races are Kudus 15km, Dischem 21km, Striders 32km and then Johnson Crane 42km). In PE they skip the short stuff and head straight into ultra season – or so I thought. When I verified this approach with a group of runners from Charlo Athletics Club asking them, “Is this Port Elizabeth’s first marathon of the year?” they replied, “No we already had one at the beginning of December!” So there you have it, PE is on a time zone that is at least one month ahead of the rest of the country. Everyone I saw kept on going. Not sure where the gay runners had to go and why they had a different route? As most of the field run the race as a Comrades and/or Two Oceans qualifier, this race takes an official time at the marathon mark as well as the finish line – and you can use the better of the two “time brackets” for your seeding. However, this does lead to a number of runners wimping out and doing a planned bail at the marathon mark (there must have been at least 40 cars parked here). Personally, I don’t think the beer would taste right if I’d run 42.2km and not continued another meagre 8km to get an official finish. Many runners bail at the marathon mark and don’t get to see the lighthouse at the end of the ultra. Winners get a cool lighthouse trophy (made out of beads by local crafters). This is what a “slog” looks like in Port Elizabeth. I had a flight to catch but there was still time for a few photos as the finish line approached – my main objective was to finish in time to have a shower and then enjoy a few free airline lounge beers before the flight home (thanks Diner’s Card!). This mission was duly accomplished (as you can see from the photo below). Made it in time to replace lost minerals with some free airport lounge beer. 2018 has been great so far, three terrific marathons completed and I’m three notches closer to my goal of 100 Unique Marathons. 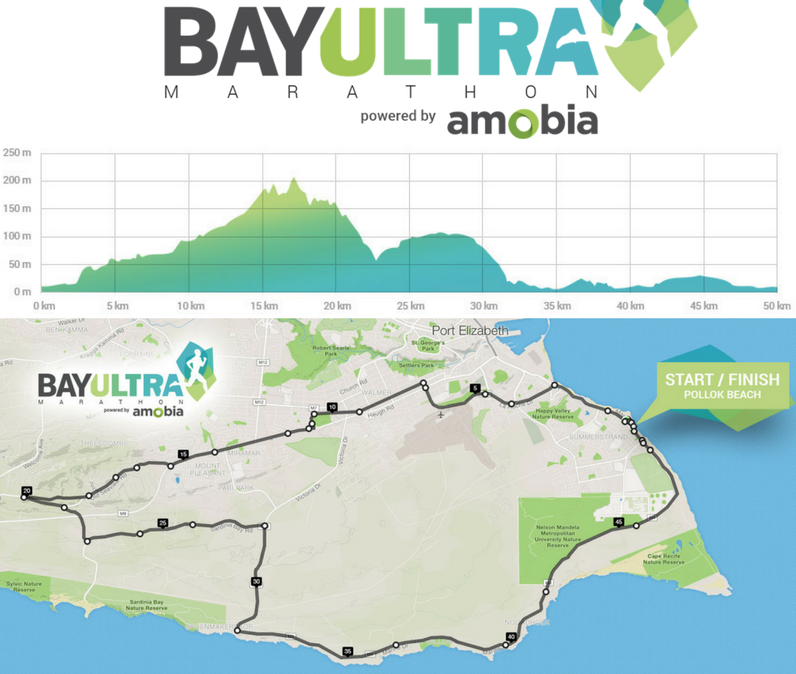 If you fancy a trip to the Friendly City, I’d recommend you do so on the first weekend of February and include the Bay Ultra into your itinerary – you’ll also be able to get your first ultra of the year done before everyone else in the country! 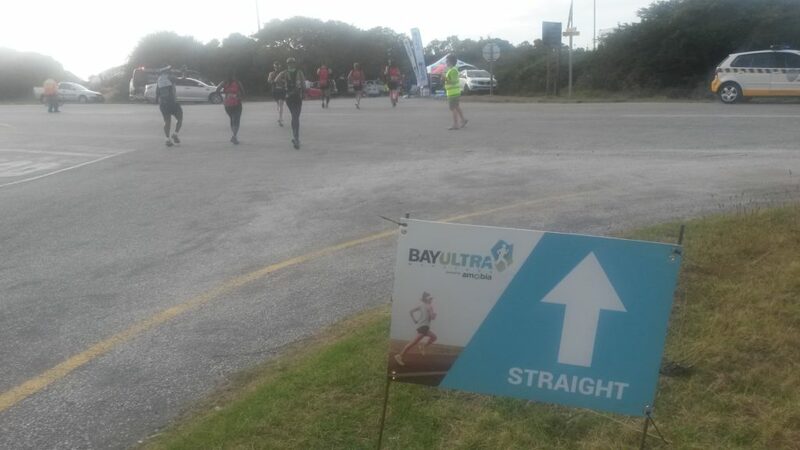 Note: The Bay Ultra has a really good Facebook Page with videos and photos from the day – check it out here. Cheers from Port Elizabeth. Watch this space for the next race report: Potties Marathon in Mokopane. 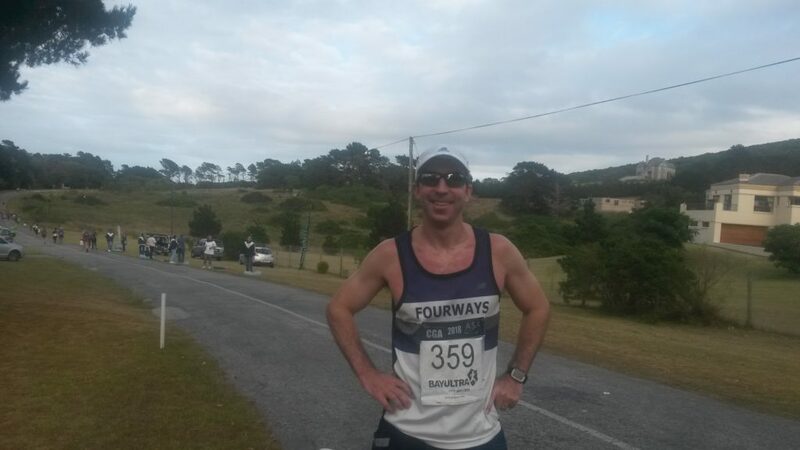 Another cracker of a marathon, this time in the South African bushveld. 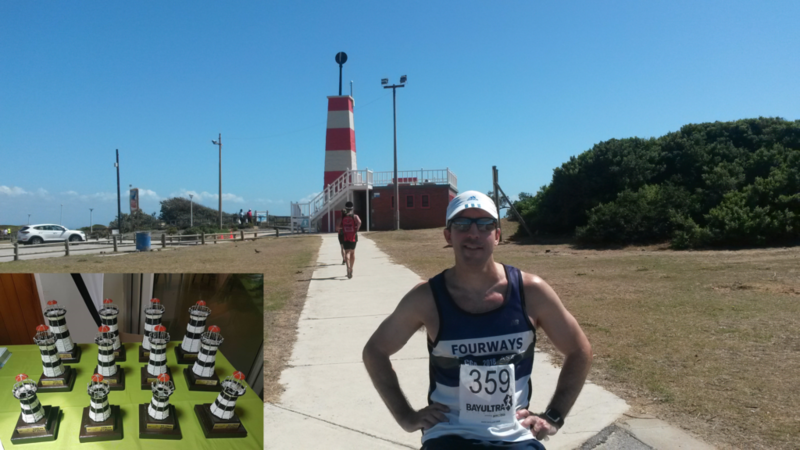 PE is a town I know very well, having run marathons and half’s along the routes you took. I can promise you that PE is a very Windy City, and you were lucky not to encounter same. Enjoyed your comments regarding BA. flying almost any other airline (not SAA) is preferable. Please keep your blogs coming, I’m really enjoying them. As a total newbie to the running fraternity – in actual fact I’m still technically a non-starter – I found this very humorous. And of course the best thing about it, is the lobely way you portray Port Elizabeth. Thanks so much for the shout outs – for Bay Ultra and Amobia. And we really hope you’ll be back again next year. 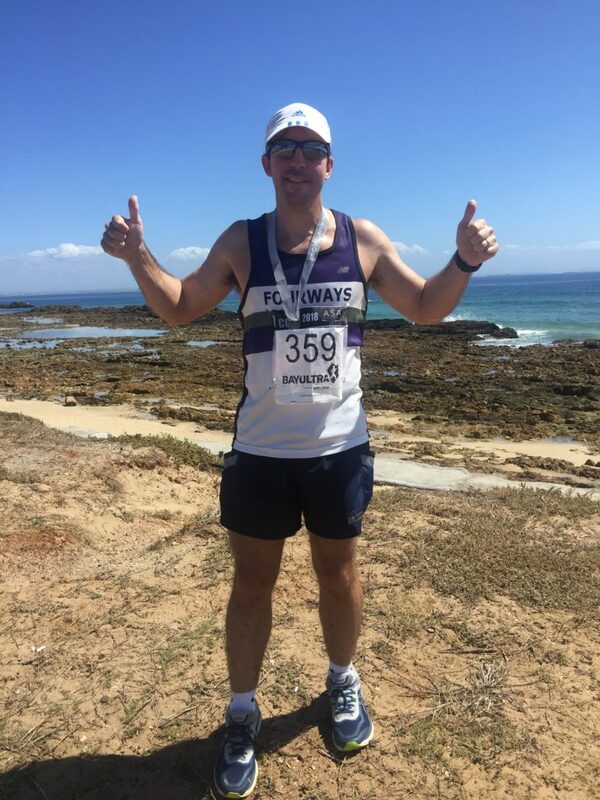 Pleasure – I hope that the reports get other runners consider the smaller marathons as an option instead of running the “same old boring races” every year. I will definitely be back for another loop around Algoa Bay. Not sure when though – I have a stretch goal to run every marathon in South Africa so that is going to keep me busy for the next few years!